Foliactive guarantees results in the prevention and reduction of hair loss for any of its products. The pills to prevent hair loss, along with the spray and comb, Foliactive Laser, have been tested by many customers giving positive responses of our products. What are the results of the Foliactive hair loss program? All people with self-esteem issues due to the weakening of their hair look to find a solution that works. This problem can now be overcome thanks to the Foliactive products. The pills, as well as the spray or laser comb, produce benefits to strengthen hair and prevent the weakening of it. Why is Foliactive so effective? 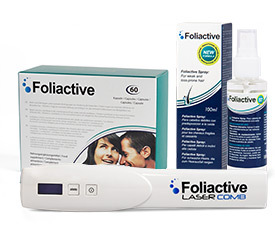 The most specialized techniques on the market, such as laser light; the Foliactive Laser and Vibratonic® technology make this product special. It acts directly on the hair and scalp resulting in the strengthening of the hair follicles by light and a vibrating massage, preventing hair loss. The composition of all products is completely natural. The Foliactive brand works to research further and improve formulas as with Foliactive Spray with its new plant composition with Bio-Capigen Veg, which provides many more nutrients to hair. The same applies to Foliactive Pills, whose ingredients are responsible for strengthening the hair follicles naturally. The combination of active ingredients of all our products is what makes it advisable to supplement the treatment with each other, thus achieving the expected results to prevent hair loss by Foliactive Pills, Foliactive Spray and Foliactive Laser. Foliactive Spray also helps improve hair quality: reduces dandruff and grease to bring the brightness your hair needs. The results of any Foliactive product varies depending on the personal characteristics of each individual and the state the hair is found but in general, the results are visible within a few weeks. During the first month, using any Foliactive product, you can see results such as strengthening the hair, less hair loss and shinier hair. Much less hair loss and hair is noticeably strengthened by combining several Foliactive products. It is at this stage when appreciated results are achieved. resulting from the regeneration of hair follicles. The hair is fully strengthened and hair loss is much lower. The results are more noticeable. The hair is much stronger and it is advisable to continue using the products as maintenance to further strengthen the hair. Once past the 5 months of treatment, continued use of any product can be used as maintenance. Customers, who have tried any of our products, have ensured the effectiveness and the magnificent results obtained combining all for their personal use.